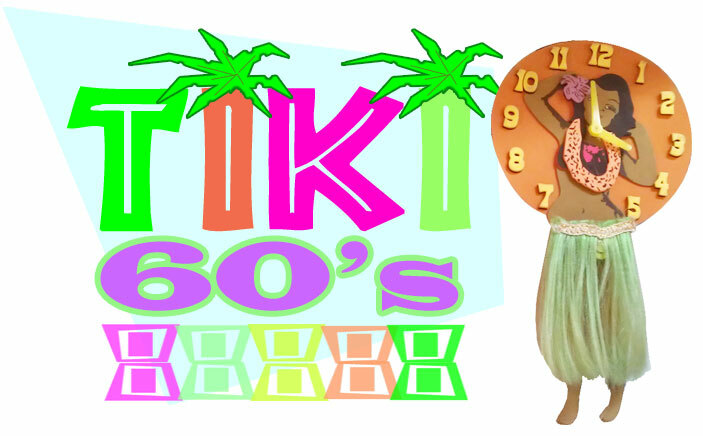 I can remember those great 60's summers when around 1965-67 a sort of "Tiki Fever" set in, and everyone and everything seemed to go tropical. During our hottest days in the pacific province of Portland, Oregon, it was great to imagine a whole new laid back lifestyle. Living life in a pair of Bahama shorts, Hawaiian shirts, and rubber thongs seemed to be the greatest thing in the world. We knew how to celebrate summer then. Better yet, movies like "Dr. No", Swiss Family Robinson" and "Mysterious Island" which depicted exotic locales brought us all in touch with our inner palm tree. It was great fun in the heat of summer to imagine ourselves on a tropical island somewhere, stranded without rules, school, or chores, just free as a kiki bird to play and swim all day whilst consuming coconuts and whatever fish we could find. However, when the movie was over, and the day had drawn to a close, we were back in our living rooms dreaming of the next day and whatever adventures (real or imagined) may present themselves at our doorsteps. Living rooms soon became drawn into the Tiki-Craze. The 60's were a very simple, but lively time. Nothing was immediately available at one's fingertips. My Mom went Tiki by going hula, decorating Hawaiian, and rendering with faux bamboo. The Tiki bars were very commonplace in basements of better-to-do homes. I can recall the velvet paintings of some tropical scene on a black velvet canvas. Hawaiian shirts were popular, and I had several as a kid, but could only wear them to school. They were considered "good shirts" that I was not allowed to play in. My mom would listen to Hawaiian records til I thought my ears would bleed. One of her favorites was a Percy Faith collection of Hawaiian music. As the summers drew near, the Tiki Fever became more apparent. We always had The Beach Boys and they were about as close to heaven as it was going to get when it came sun & surf. Their song "California Girls" strikes a resonant chord within me to this day, transporting me back the glorious summer of 1965. "Sidewalk Surfing" was how we referred to skate boarding. By this time, the skateboards had improved radicallly. They were shaped like surfboards and some of them even came with a cool design on them. My first board was in 1964, a red Roller Derby stick with metal skate wheels. TikiPunch! When Shasta released their infamous "Tiki Punch" it quickly became one of my favorites in the soda pop sanctuary. One of my favorite memories is of the next door neighbor kids and myself armed with Tiki Punch, red licorice, and whatever else the corner store featured for pennies, sitting around watching "The Jar" on The Alfred Hitchcock Hour. The show was featured on late night syndication on one scorching summer evening. Very soon the corner store couldn't keep enough in stock. Tiki Punch soon brought us back to our other favorites such as Hawaiian Punch and Hi-C whenever the Tiki was gone from the shelves. Tiki-Fornia! When I was growing up in those fabulous sixties, I remember thinking there were two places that I thought would be the hippest spots on earth: London, and California. California was so cool; everything exciting was coming from there. California almost seemed too fantastic to be real, and I always envied the kids that grew up there. The Beach Boys, bikinis, surfing, beach parties, and radical cars, were a Cali-signature. Everything important seemed to come from California. Granted I'd never visited there, but I drooled over the locales just the same. L.A. was a cool hot spot, and of course, Malibu seemed to be a place so great they even named a car after it! California was everywhere in the 60's. It was on TV, in the movies, the magazines, the news, the fashions, food, and the fun. The skateboarders inspired us all to shine by imitating some of the most wild and often dangerous maneuvers. I remember being drawn to surfing like a magnet. I always wanted to "shoot the curl", but never made it any farther than the living room TV set. For me, Tiki-TV was any kind of jungle show, or a program that took place in the tropics that provided a high degree of adventure. Comedies were okay, but not tops on my list (unless of course Jerry Lewis was in it). One of my favorites was "Daktari" a fun show starring Marshall Thompson and a loveable Clarence, the cross-eyed lion. Though hokey as anything could be, "Tarzan" was another of my old-reliables simply because it was Tarzan. Soon, "Hawaii 5-0" joined the ranks. I only watched Five-O a few times as it was never a favorite for me. Only the theme song held any appeal. Great fun was always trying to play jungle, or find areas that closely resembled a jungle area. We lived in one particular house where the backyard was fenced by a giant hedge that had grown to over 6 feet high. Behind the hedge was a rather large yard (probably an acre) that grew grapes. So, there were all these rows of grapes on the other side of the hedge. We'd all excavated a tunnel through the bottom of the hedge and behind it was this large, shaded, and extremely private area. There was also a huge shade tree we could climb. In the summer of '65, that was as close to any real live jungle as we were going to get. Add a dash of imagination, and there you were! Previous Page Back to top Next Page: Classic Cars!